Here are JOCO’s answers to those burning questions. The frequently asked ones. Seeing the enormity of the waste created by disposable cups was more than enough to get us actively thinking of ways to reduce the environmental impact of everyone’s beloved daily coffee and tea experience. This everyday part of life is so good and adds value to the day, yet at the same time is putting a strangle hold on mother nature. What can be done? And how can it be done in a way that does not compromise this experience? These questions were what sparked the evolution of JOCO’s “Cups That Care” mission. We care about the environment and we care about maintaining the flavour of your coffee or tea. At JOCO, we believe that you can experience life’s luxuries without conceding taste, smart design or the natural environment. We encourage you to enjoy your brew responsibly in a fine-looking cup! The JOCO philosophy is simple: longevity, flavour & style. Glass lasts longer, never affects flavour and always looks best. 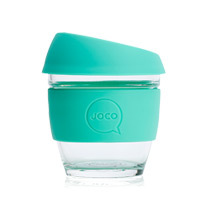 Our thoughtful practises and clever products make JOCO, the ‘Cups That Care’. JOCO’s spread its wings and crossed the oceans to new territories. We have distributors based in Europe, Japan, Canada, New Zealand, South Africa, Asia and also ship from within the USA. We are doing our best to share our great experiences with you. And yes we do ship world wide so it doesn’t matter where you are. Why choose a glass cup? Why glass you ask? Because it’s not plastic. We care about the way your beverage tastes and the way the cup looks. After all, drinking coffee and tea is a part of everyday life. Glass is in it for the long run, it’s hygienic, and doesn’t beat up your taste buds or Mother Nature. Boro what? We could go into an elaborate scientific explanation, but all you need to know is it was founded by a German glass-making magician named Otto Schott in the late 19th century. It is well known for its resistance to thermal shock and acids, heat retention, is light weight, shock resistant, non-porous and has great optical clarity. 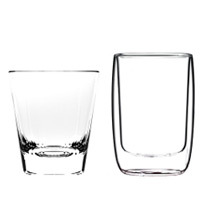 Borosilicate glass is free of harmful chemicals including all types of Lead, BPA, and Cadmium. It’s durability also makes it microwave and dishwasher safe. Yep, borosilicate glass is high grade and the logical choice for your new best friend. Why does the JOCO cup have a silicone sleeve? You want your crafted brew kept at the optimal temperature and your hands kept cool. Available in fifteen different classy tones, the JOCO thermal silicone sleeve provides double benefits, protecting your hands from the coffee’s heat while providing further insulation for those treasured contents. The sleeve also helps protect your little friend from any unwanted breakages. What other products does JOCO have in the works? You’ll have to wait and see but we have some great ideas in the boiling pot. Sign up for updates and we’ll let you in on the latest brand and product updates… we promise not to swamp you with spam. What is the packaging made of and why is it better for the environment? Incorrect or miss labeled packaging is a big contributor to the single use and plastic waste issue. It plays an important role in the product life cycle, but it should be considered carefully to ensure a minimised footprint that provides maximum value. Unfortunately over packaging and plastic packaging plagues our world. 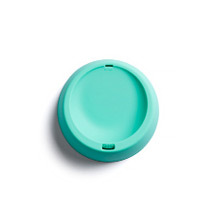 Just like the paper disposable coffee cups that can’t be recycled due to the plastic lining, a lot of packaging made from sustainably sourced materials is rendered non recyclable due to the application of a fine plastic film to enhance appearance. 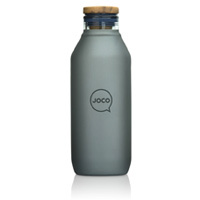 JOCO packaging is made from recycled materials, sustainably sourced materials and is also 100% plastic-free. Truly suited to an ongoing circular model. We care for every component that we produce and are responsible for its low impact Journey. Does JOCO sell parts separately? We certainly do! You can mix, you can match, and should you have an incident with the glass, we are on the ready with a replacement in your size. How do I take care of my cup? Fear not! We have our cup care instructions available for download! Handy, we know. You’ll find all the info you need without butchering a tree. If you have any further questions, check out the contact page and get in touch. Most certainly. All of our parts are microwave safe. Be sure to remove the lid before reheating any liquids, and definitely check the temperature before drinking. Where can I purchase the JOCO cup? Right here! Otherwise if you want to get your mitts on a cup and feel out its smooth curves, hop along to one of our fine stockists. Checkout our stockists page to find your closest retailer. How long will it take for my beloved JOCO cup to reach me? Within Australia we send your order via Australia Post. Standard delivery within Australia typically takes 1-3 business days, depending on where you reside. The orders are shipped from Melbourne so allow more time if your in WA, NT or far North Queensland. We certainly do! Unless you’re in the middle of the Sahara or in the depths of the Artic, we can get a JOCO cup to you in about 5-10 business days. For more info, wander over to our Shipping page. How can I stay up to date with the goings on of JOCO? Join our mailing list, or tune into one of our Social Media channels. We’ll be sure to keep you in the loop without driving you nuts. We really pride ourselves on quality and delivering a premium product to you. So we are really sorry if one has slipped through the keeper. Choose wisely, as JOCO doesn’t issue replacements due to change of mind. Check out our Warranty page for further information. How do I return my cup? In the event that you need to return a product, we have tried to make the process as painless as possible. Please contact customer care so we can get you sorted. Can I trust you with my personal details? Absolutely. We pride ourselves on running a professional outfit and your privacy is important to us. Read through our Terms for a detailed explanation on how we keep a lid on your personals.